Lush Fab Glam Inspired Lifestyle For The Modern Woman: The Fashionista's News Guide December 13 2011! The Fashionista's News Guide December 13 2011! 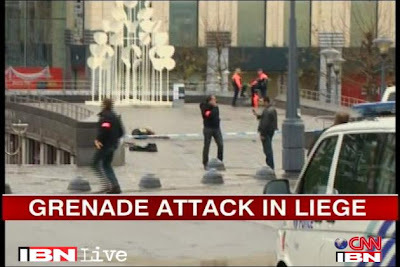 'A gunman has opened fire in the centre of the Belgian city of Liege, killing at least three people and wounding 75... He also threw grenades into a crowded square from a rooftop before killing himself, reports say. He was known to police for firearms offences. 'The attacker was named as Nordine Amrani... Earlier reports said at least two more men were involved, but officials said the attacker acted alone. Terrorism was not a cause, they added.' Read More on this developing story. This is so sad right before the holidays too. Not surprised to hear the coward killed himself took the easy way out. Whats with these psychos shooting up people in public places and how did he get grenades?